Heading into the 2017 season, the Vikings will need to find an identity in the red zone. 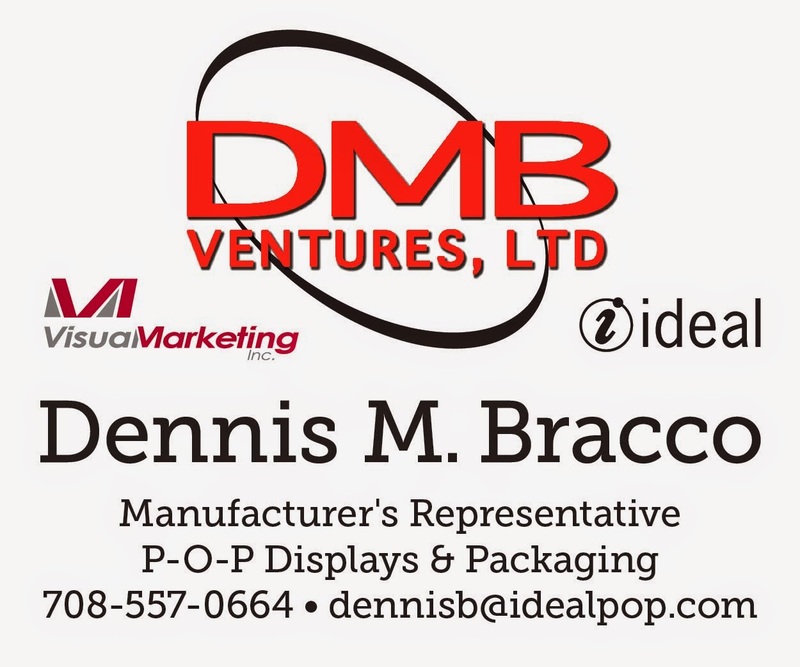 Daniel House discusses how the Vikings can improve their recent woes inside the 20-yard-line. Updated: July 6, 2017 2:55 p.m. The Minnesota Vikings finished 2016 with one of the worst red zone attacks in the NFL. A lack of creativity on offense, poor offensive line play, and a struggling running game, left the Vikings frequently kicking field goals. Despite the Vikings having one of the better defensive units in the league, they couldn’t sustain success because they were unable to punch the ball into the end zone. Inside the 20-yard-line, Minnesota particularly struggled to be effective on third down. According to ESPN Stats and Info, the Vikings had a 57.7% third down conversion rate in the red zone. This figure ranked 27th among NFL teams last year. Many of those struggles were attributed to the lack of weapons and balance the Vikings had on offense. Minnesota also consistently forced a running play or threw a pass short of the end zone. The offensive line issues and lack of creativity really impacted their ability to convert on third down in the red zone. The defense had a heavy strain placed upon them when the Vikings were unable to score over 21 points per game. Many people felt the lack of red zone success was due to the poor offensive line play and the absence of Adrian Peterson. 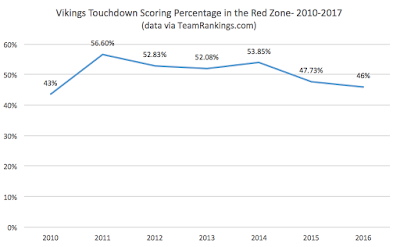 Obviously, they were contributing factors, however, a look at the past seven years show the Vikings’ red zone offense has been below average. 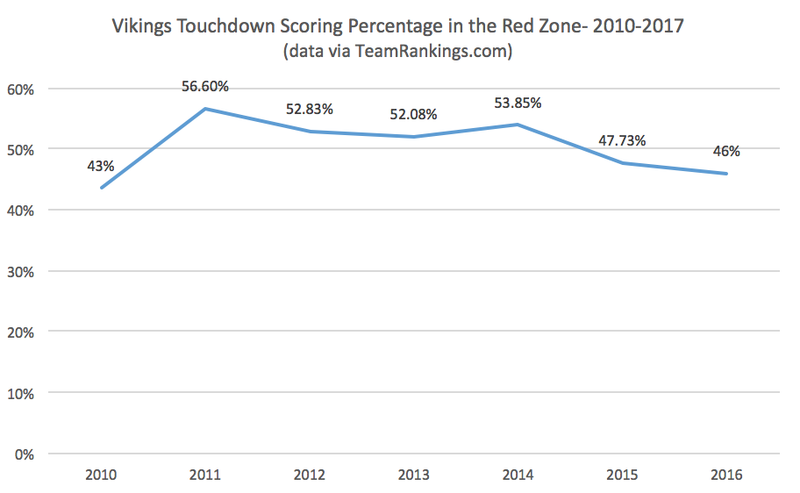 The Vikings have averaged a ranking of 20th in red zone touchdown scoring percentage over the last seven seasons. They have scored touchdowns inside the 20-yard-line at a 49.8% clip during the same time frame, according to Team Rankings. So how do the Vikings improve in the red zone in 2017? The Vikings often ran power packages and brought in an extra offensive lineman to help improve their push up front. This was a dead giveaway Minnesota was going to be running the football. When the Vikings ran these sets, the offensive lineman didn’t execute their assignments and were unable to communicate sufficiently. This was especially the case when they deployed pulling guards. With Mike Remmers and Riley Reiff being reliable run blockers, it will help the Vikings rushing attack on the goal-line. Nonetheless, the team must get more creative on offense. Spreading the field and utilizing Sam Bradford’s accuracy should be a priority inside the 20-yard-line. With better protection up front, passing the ball should be less stressful in the red zone. Bradford had a top-five accuracy percentage in the red zone (64.1%) and Pat Shurmur’s West Coast style system should maximize this. Running out of the shotgun and hitting on short-to-intermediate crossers, along with touch fades are more efficient when you can spread the field. Not to mention, it isn’t as predictable. As I discussed above, the Vikings must find ways to be more creative inside the red zone. This starts by developing balance between the run and pass. The Vikings had four wide receivers --Stefon Diggs, Adam Thielen, Jarius Wright, Cordarrelle Patterson – in the bottom 25 of league wide receiver red zone targets, dating back to 2014, according to TJ Hernandez. The Vikings do have a large portion of their offense that runs through Kyle Rudolph in the red zone (33% of end zone targets). Nonetheless, the wide receivers have been plagued by questionable play-calling over the last three seasons. Three straight running plays or two runs and a pass short of the end zone have occurred far too often. Over the last three years the Vikings have ran the ball 52% of the time in the red zone. During the same time frame, they finished 30th in passing attempts, but ranked 12th in rushing attempts. This shows the offensive balance has favored the run over the last three years. In order to become more of a widespread threat on offense, the Vikings need to deploy their passing weapons. Offensive coordinator Pat Shurmur must find a healthy balance between the run and pass by attacking the end zone with short-to-intermediate passing. 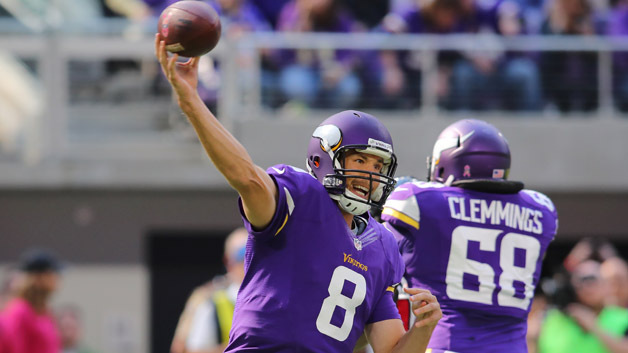 Hopefully, with quarterback and coordinator stability, the Vikings can get into a better rhythm this year. The idea of having Laquon Treadwell and Michael Floyd split out wide with Stefon Diggs and Adam Thielen rotating in the slot is intriguing. Not to mention, Kyle Rudolph and draft pick Bucky Hodges can be split out wide to create mismatches. In addition, it would be interesting to see Jerick McKinnon running routes out of the slot. He needs to be placed in space to garner his athletic skill-set. The Chicago Bears game from last season is the way McKinnon should be used throughout next season. The Vikings ran him on wheel and arrow routes out of the backfield, allowing his athleticism to be fully utilized. This year, the Vikings have more threats inside the 20-yard-line, which adds a new element to their offense. Maximizing those resources should be a priority as Minnesota attempts to bolster their red zone offense. As GM Rick Spielman said a few weeks ago, the Vikings need to score over 21 points per game and they’ll win more games because of their defense. Last year, they were only able to score 20.4 points per game, which is a number they must improve by scoring in the red zone. Last year, 62.23% of Minnesota’s overall plays were through the air. What’s more, the Vikings threw the ball 54.5 percent of the time in the red zone, according to NFL.com. This is attributed to their inability to run the ball effectively. The Vikings averaged a league-worst 3.20 yards per carry and defensive units teed off against the pass. Teams didn’t respect the run because Minnesota was so unbalanced and ineffective on the ground. Last season, Jerick McKinnon was used on 30.8% of rushes inside the 20-yard-line, while Matt Asiata accounted for 55.4%. McKinnon had just two rushing touchdowns and Asiata tallied six. The Vikings notched just eight total red zone scores on the ground among their running backs. With Asiata gone, the Vikings drafted Dalvin Cook and signed Latavius Murray to bolster their rushing attack. The team hopes their total red zone rushing touchdowns will increase after adding a red zone runner and dynamic shotgun ball carrier. In 2016, Latavius Murray accounted for 66.7% of Oakland’s red zone rushing plays, scoring 11 total touchdowns. In addition, Dalvin Cook was dynamic out of the shotgun at Florida State, which is something the Vikings have lacked. An accurate quarterback, more weapons in the red zone, and an active running game, should take a strain off every portion of the offense. However, if the Vikings want to win more football games in 2017, they must start scoring touchdowns by becoming more balanced and running the ball effectively. Executing the above strategies would be a great start to getting the Vikings’ red zone offense back on track. Great article but give me your honest opinion pre training camp of the Vikes? ?